The 2018 Urban Future Global Conference was held in Vienna, Austria. Several 4CITIES students attended. Photo source. As a bigger portion of the population lives in cities, urban stories become more and more important for both specialized and non-specialized readers. Sources such as The Guardian: Cities, Next City, City Lab, CityMetric, and This is Place are no longer read exclusively by professionals and these sites no longer write articles for a niche public of architects, urban planners, and geographers. For this reason, UN-Habitat included urban journalism in its New Urban Agenda as a key factor for global change since the role of the media is “considered crucial to raising awareness about the New Urban Agenda among a wider audience” (UN Habitat, 2016). 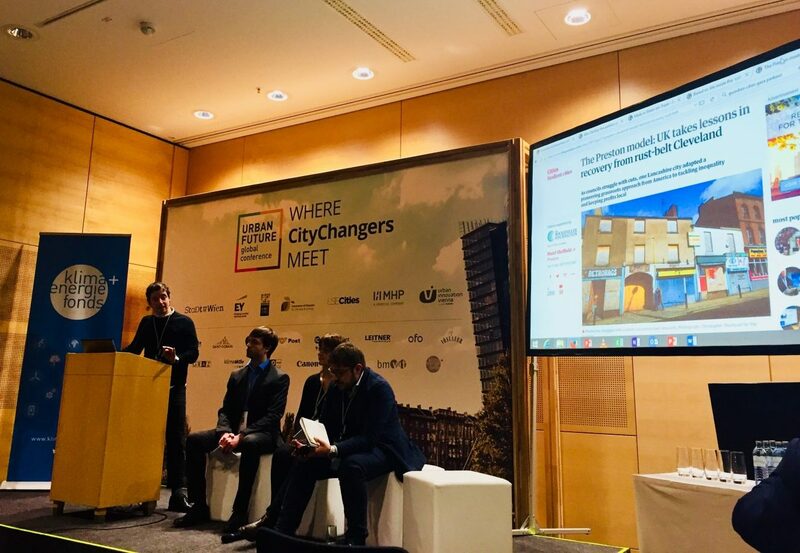 As part of the Urban Future Global Conference (UFGC 2018) and paired with this New Urban Agenda, UN-Habitat organized an Urban Journalism Academy session, a panel formed by Jeanette Elsworth, UN-Habitat’s Head of Press and Media, Nicola Vattauer, Communications Director of Eurocities, and Christopher Michael, Editor of Guardian Cities. This session contrasted with the overall conference since it targeted journalists and not urban professionals. Paradoxically, during the UFGC, the panels dedicated exclusively to urban planning and other policy speakers brought up a constant claim, lack of communication, which was mentioned as an obstacle to the development of urban policies. Questions like, what is the best means to communicate? How can data improve communication? How can we inform communities? What is the best way to provide information? arose in many sessions, revealing that although current trends in urban planning, such as the humanist approach, tend to engage citizens in urban policy-making and decision-making processes, communication seems to still be a challenge in the implementation of these policies. In this context, it seemed pertinent to ask whether the media could play a bigger role in the relationship between urban professional stakeholders (planners, activists, politicians, public servants) and civil society. The answer is not always clear. Communication between stakeholders and civil society cannot be delegated exclusively to the media; however, as urban issues have gained relevance in journalism, different media outlets become an important channel for people to be informed about urban topics. Guardian Cities editor Christopher Michael at the 2018 Urban Future Global Conference. Photo by author. The relationship between governmental institutions and journalists is generally based on a push-and-pull dynamic in which looking for stories and doing journalism appears still very far from what UFGC speakers seemed to be looking for. But even if urban design is not based on its journalistic attractiveness, it is clear that there is an increasingly important relationship between public opinion and urban development; in Christopher Michael’s words, a very strong critical media is absolutely vital in getting anything done at a government policy level. Incorporating the media within the urban planning process allows us to think of the media as agents of change on how we see and think of cities. Urban journalism is still a relatively young focus and has a long way to go but its relevance and the proliferation of platforms interested to share knowledge in cities seem to be evolving vis-a-vis a new approach to urban planning and policy making. As part of the New Urban Agenda, UN.Habitat claims that “journalists already chronicle life in the city, give voice to urban changes, and describe urban reality from different points of view. Now is the time to encourage a more proactive and substantive role of media in the development of the city” (UN Habitat, 2016). This approach to urban journalism opens the discussion of what the media chooses to cover, and the way stories are told. As civil society is being more involved in planning, the media are also becoming actors in these processes. For that reason, the frame from which specialized journalism portrays stories around urban development is the next step we should look at in this complex relationship. The curation of the information covered may affect the way cities are perceived and shaped because, as Michael stressed, different from a researcher’s perspective, in journalism, “what we really look for is not issues, we look for stories and you have to have a great story to illuminate an issue, you can’t start with an issue and then try to find a story.” Even if urban issues and developments have caught more attention they are still part of the informative cumulus an average person has to deal with every single day and storytelling has particular ways to foster interest. Stories and storytelling are important in the communication process since they allow readers to understand how macro-level decisions affect their everyday life in the micro-level. In this sense, Michael explained that in order to not only address architects, urban planners or specialized readers, urban journalism needs to attract the kind of a global audience for some of these stories because they really matter even to people who don’t have a formal training. Michael himself is neither a trained architect nor an urbanist, however he considers his job as “sitting around, curating ideas and finding stuff,” a duty that his team and him complement by spending a couple of weeks in cities around the globe at least once a year from where they inspire to write stories. Which stories should be told, and why? 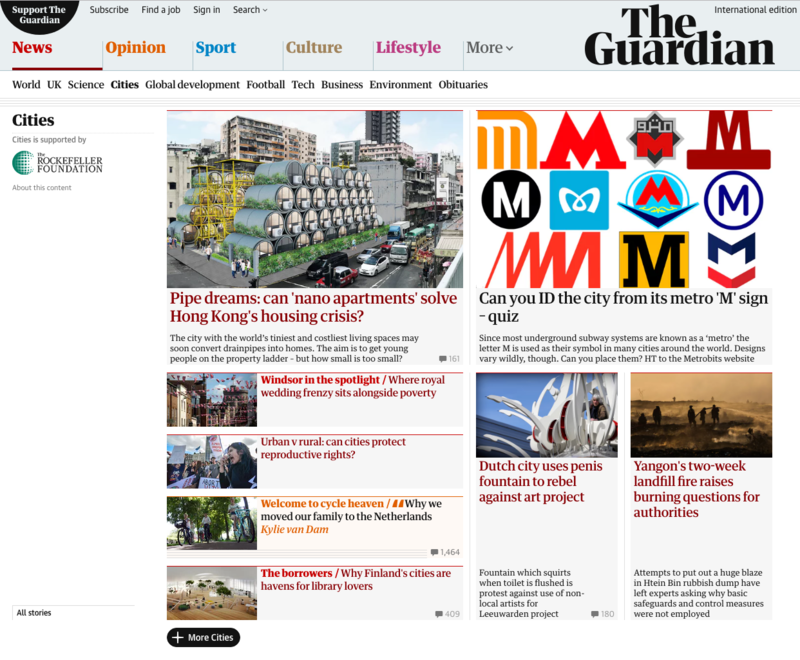 The Guardian: Cities. Despite the increasing interest on urban stories, urban journalism is still not a main priority for all readers. Urban journalism faces the same publishing dynamics as any other specialized journalism, in other words, not all topics interest all readers and not all issues affect all publics. Additionally, the fact that there is an interest for a particular topic does not mean that that is all readers want to be informed about. As Elsworth clarified, from UN-Habitat’s perspective, the oscillation between what is considered “important issues” and what people actually want to spend their time reading is distant. As Elsworth stated, it should be part of a natural course in which people realize that urban policy and development affects them directly. A course that has already started and seems to be attracting more and more attention. The journalist aspect of urban studies and urban planning has seamlessly gained relevance among specialized and non-specialized public since it has become a tool for accountability and democratization of the way cities are transformed. This means that having urban stories in the media gets citizens closer to urban planning and policy making, however these stories are not a tool for planners and governments to communicate their messages to their citizenship. The equation may work the other way around; urban professionals have new ways of scrutiny not only from civil society groups but also from public opinion. Current discussions around urban journalism should focus on the stories they cover and the way these stories are told.